She'll feel like stampeding with joy when she goes in this tween zebra costume! This girls zebra costume is made of polyester and features a dress with a black torso. The back clasps with Velcro, and the pleated skirt has a zebra print portion with black portions that have blue trim. The back of the dress also has a plush zebra tail attached by Velcro, and two straps to cinch the dress tight. The included hoodie shawl is all zebra print with light blue piping trim. The front opens with an easy zipper, and the hood, when propped up, shows off two ears and a fuzzy black mane. The long sleeves of the shawl have zebra print as well, and end in black cuffs. 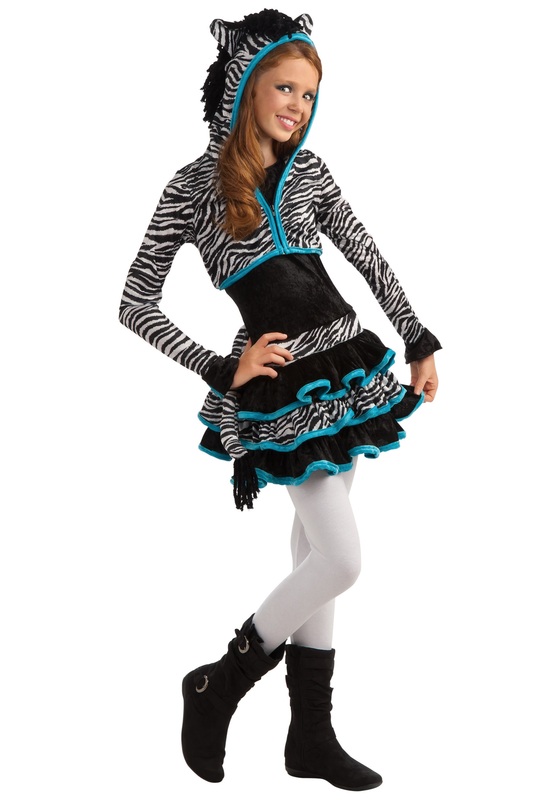 Be the wildest animal at the school party when you go in this tween Zebra costume.